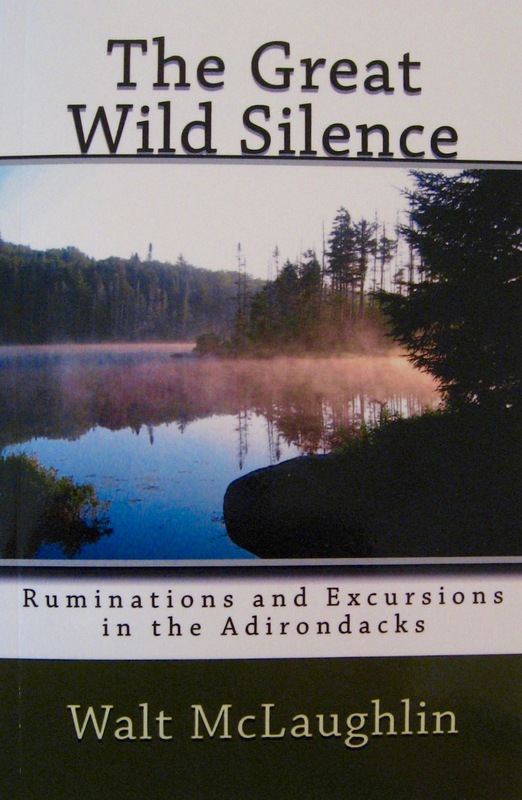 Five years after the release of The Allure of Deep Woods, I now have a second Adirondack book in print: The Great Wild Silence. 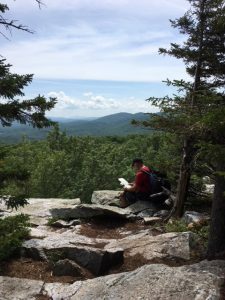 It consists of a dozen short narratives and essays about backpacking in the Adirondacks, along with one rather long narrative about my 5-day sojourn in the West Canada Lakes Wilderness last year. The Great Wild Silence is the juxtaposition of movement and staying put, of hiking and abstract thought. 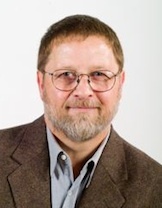 The main narrative in this collection, “Deep Forest Ruminations,” is a series of meditations on nature and our place in it, braided with observations and routine activities while camped alone at a backcountry lake – just me and my dog Matika, I should say. That’s the second half of the book. 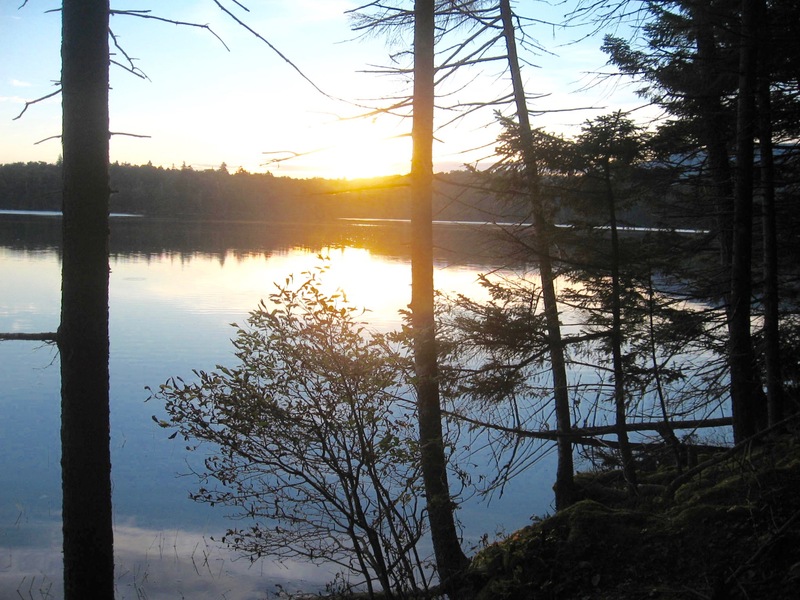 The first half sets the stage, recounting various excursions in the Adirondacks over the past 25 years, both alone and with others. Some of the latter pieces first appeared in the ADK publication Adirondac and other periodicals but haven’t been seen since. I’ve extracted others from previous collections of mine. It’s a curious mix to be sure. If you’re as enamored with the Adirondacks as I am, then you’ll probably enjoy this book. You can order it at my website: woodthrushbooks.com, or you can find it at Amazon.com. Be forewarned, though: there’s a lot of philosophical speculation in this book. It isn’t just about walking in the woods. After driving in out of downpours for 4 hours, then making my way up several miles of partially flooded dirt road, I parked my car at a trailhead and started hiking into the West Canada Lakes Wilderness. My dog Matika was right behind me, just as happy as I was to be slipping into the wild despite a light rain falling. The rain stopped halfway to Pillsbury Lake but the trail was a stream by then and the forest was soaked. A rumbling in the distance. Hmm… Sounded like another storm approaching. We rolled into the shelter at Pillsbury Lake right before the next big downpour. Surprisingly enough, Matika and I had the place all to ourselves that night. So I strung a line inside the shelter and dried out my wet clothes and gear. The next day was a different story: mist in the morning burning off to a warm, sunny day. Buggy, yes, but a nice day all the same. I looked around for a good place to camp but didn’t find one. So I spent a second night in the shelter. Again, no one came along. The idea was to stay put instead of pounding trail, to hang out by a lake for 5-6 days, groove on the wild, and record my thoughts in a journal. That’s exactly what I did. On the third day, Matika and I grew a little restless so we went for a day hike to another lake in the area. That took a few hours. But for the most part we just sat. And we had Pillsbury Lake all to ourselves for a third night. On day four, I was feeling pretty crunchy. Staying put had mellowed me right out. Ditto Matika. Chipmunks, sparrows, butterflies, and other critters started overrunning the camp. Neither one of us did much about it. Meanwhile, I just kept on scribbling in my journal. 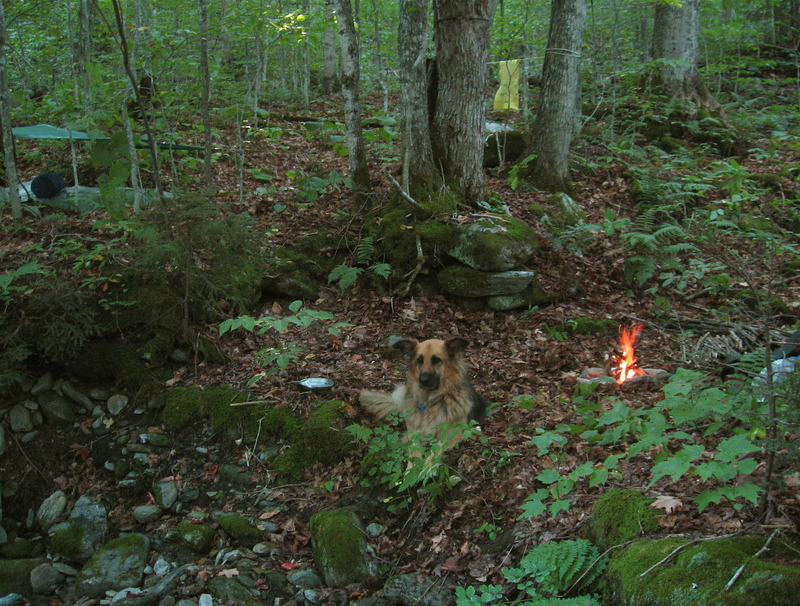 At dusk when I went to put out my campfire and go to bed, I thought I had the place all to myself for a 4th night. But a pair of hikers came along an hour or so later. They were nice enough fellows. Still their sudden appearance broke the spell of my deep woods solitude. There would be more hikers on the way, no doubt, with the weekend fast approaching. So the next day Matika and I hiked out. It’s hard to say what value the words I wrote in my journal have, or what exactly happened to me while I was out there, but I returned home incredibly relaxed, lighthearted and happy. My wife Judy found that amusing – so amusing that she waited a day before trying to have a serious conversation with me about anything. She saw the wild in my eyes. Hard to miss, I’m sure. Yeah, I went deep this time. Finally the Maine hiking narrative has reached print. A lot of readers have been waiting for it, I realize. 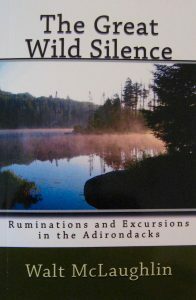 I’ve been busy promoting my Adirondack book during the past year and a half so I’m just now getting around to publishing this. 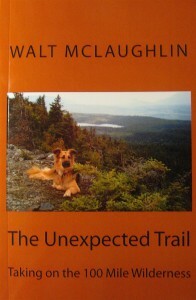 At any rate, The Unexpected Trail is now available both as a paperback and a Kindle download at Amazon.com. Those of you would like to purchase it directly from me can go to woodthrushbooks.com. I’ll have copies in-house and ready to ship in a week or so. The Unexpected Trail is a detailed account of my trek through the 100 Mile Wilderness, located in northern Maine. 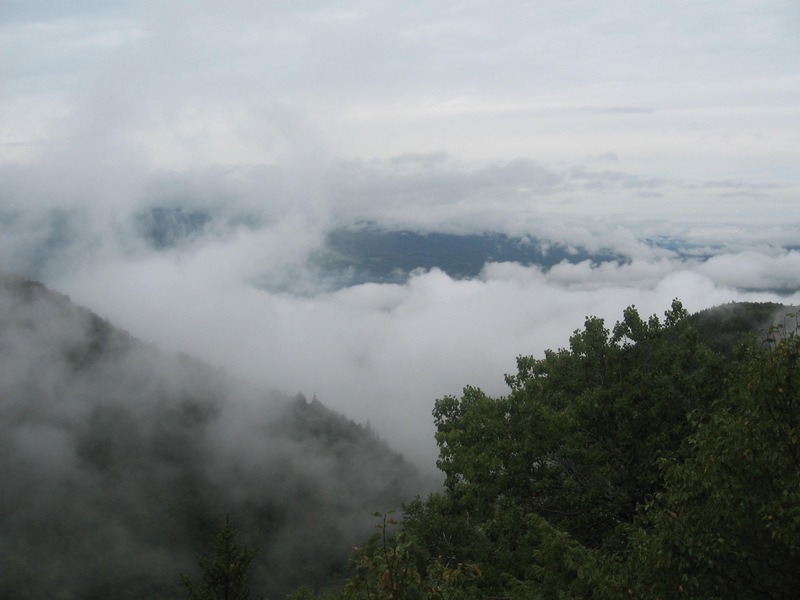 It’s the most remote section of the entire Appalachian Trail, where supplies cannot be acquired. That means anyone hiking it has to carry provisions enough for ten days, at least. Fording rivers, traversing two mountain ranges, and slogging through bogs – yeah, it was a tough hike to be sure. 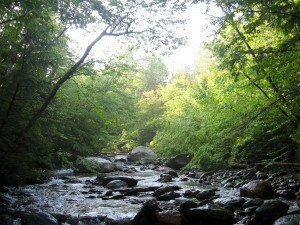 But Maine’s sprawling North Woods is lush, wild and beautiful. 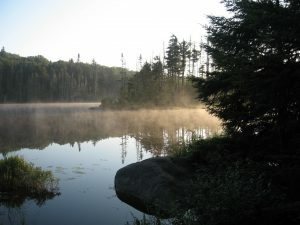 Most of its backcountry lakes and ponds are pristine. Well worth the effort, even for a chubby, old woods wanderer like me. 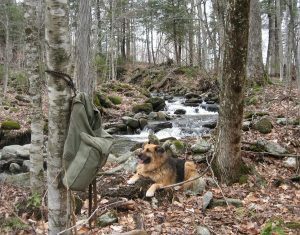 Matika, my longhaired German shepherd, accompanied me on this trek. She carried a few things in her doggie backpack and provided lots of comic relief along the way. I was worried about her ability to navigate the toughest sections of trail, but she stayed out of trouble for the most part. This narrative is similar to previous ones that I’ve written yet it has its own distinctive flavor. I’ve done my best to capture the unique character of the Maine Woods – it’s history and ongoing land-use fight as well as its flora and fauna. I hope you enjoy reading it. Monday morning I stuffed a few essentials into my rucksack and headed for the hills. I had plenty to do at home, but when the wild beckons the work can wait. I was overdue for a night alone in the woods. I had my canine companion Matika with me, of course. Together we humped up the Long Trail two and a half miles from the trailhead parking lot to a small stream called French Hill Brook. From there we bushwhacked west, following the stream until I found a nice place to camp. I didn’t set up camp right away. Instead I left my rucksack leaning against a tree and fished the brook for a while. In most places the overhanging vegetation made it difficult to cast, but I stumbled upon a few large holes where I could present my fly properly. There a couple wild trout rose to it, taking me by surprise. I didn’t expect to find 7 to 9-inch brookies this high up. I pulled them out of the water long enough to admire their beautiful markings then put them back. I set up camp as late afternoon shadows overtook the forest. Matika lounged about, chewing on some of my firewood. Then I settled in for dinner and a little campfire meditation. The fire burned away all my concerns as I fed sticks into it. After the sun departed, a full moon rose into the cobalt sky. It’s light filtered through the trees. A cool September breeze kicked up. In the cusp between summer and fall… I reveled in it. Up at daybreak, I enjoyed a leisurely breakfast before breaking camp. The hike out was easy: downhill all the way. Soon I was back home and getting ready for a half-day shift at the store. No matter. I got my fix of wildness so I’m all set for a while.